I retired from the U.S. Navy after 22 years of service in the aviation electronics field, and I have followed the development of the Boeing X-45A Joint Unmanned Combat Air Systems program since I first heard about the program in late 2002 while on active duty. I currently work for the Training Systems and Services Group in St. Louis. The ability of this aircraft to operate in a network-centric environment and be able to fly autonomously could greatly reduce the loss of armed forces personnel and reduce the cost of lost equipment for our armed forces. Such a great device will provide a technological advantage in combat situations in the areas of combat air patrol, suppression of enemy air defenses, intelligence, surveillance and reconnaissance, and a multitude of other future functions. With the continued development of the Boeing X-45C, Boeing will truly be a leader in unmanned aerial vehicle systems. I look forward to more news on the future of these systems. I was part of a Boeing configuration team visiting India in late July. Our team was caught in the monsoon flooding in Mumbai on July 26, and we had to abandon our car and walk in chest-deep flood waters for a couple of hours. We ended up at the apartment of the Boeing field service base manager Ardeshir (Ardy) Ostadazim. He opened his home to us and treated us like family. He provided us with his own fresh clothes, since our clothing was wet and filthy. He arranged for meals and sheltered us in his apartment for almost two days, until the flood waters subsided and it was safe to go back to our own hotel. I just wanted to highlight this individual's dedication to The Boeing Company and his care and high level of concern towards his Boeing colleagues. Without Ardy, we would not have been able to survive as well as we did. You had a story about Boeing field support representatives in the December 2004/January 2005 issue. I know how valuable these teams are. I spent 15 years with Product Support, Recovery & Modification Services (Commercial), until I retired. I'm writing to ask if you would consider doing an article about a group of dedicated personnel at Boeing's Recovery and Modifications Services in Long Beach, Calif. They are responsible for performing all modifications, repairs or any work the U.S. Air Force requires on the C-17 aircraft. They are on call 24-7 and go anywhere in the world to support Air Force requirements. My son, Gregory, is a Modification Program Development Specialist. This probably sounds like I'm proud of my son, which is true. But after seeing the dedication of the other team members, I would like to see an article about what they are doing to support the Air Force. Having retired from a Modifications group, I know how valuable a team like this can be to the customer and to the company. Ken Porter's Letter to the Editor about the Turbine Division in the June 2005 Boeing Frontiers was especially interesting to me since I was there, too, starting in 1956. However, in 1964 I moved on to Boeing Vertol and stayed there until retirement in 1988. Near the Vertol plant in the Philadelphia area is the American Helicopter Museum—which, of course, displays helicopters from all manufacturers. One of those on display is the Gyrodyne co-axial, contra-rotating rotor, drone helicopter together with its two torpedoes. This helicopter was powered by two 502–10 engines. They are highly visible in the display. So the last lonely relic of the Turbine Division, the 502 in the Museum of Flight in Seattle, now has a friend—even though there is the width of country between them. I still, after all these years, find it interesting that the Employee Survey is skewed and no one likes to acknowledge it. By the survey response figures, 29 percent of people are so disgusted that they don't fill out a survey at all. That's about one third of the people working for Boeing choosing to not participate in the survey. If the survey was to accurately reflect the feeling of the employees and thus the true direction of the company, then the company would try to understand why 29 percent of the people aren't responding at all. Those are the people that may actually be able to help make a difference. For any company to have a response rate of 71 percent on an employee survey is very good. But this level of participation is notable because of the company's size and numerous locations worldwide. The 2005 sample size (96,850 respondents) and distribution across different employees groups (managers, engineers, salaried, hourly) indicate that the results are representative of the opinions for the entire population. In large organizations such as Boeing, it's unrealistic to expect response rates above 90 percent. With employees on business travel, vacation, medical leave or jury duty, a response rate close to 100 percent would be virtually impossible. As a comparison, the average response rate for our group of benchmarking companies, including IBM, Microsoft, Lockheed Martin and Intel, is also 71 percent. Be assured, Boeing is trying to address factors that may make employees unable or reluctant to take the Survey: online versus a paper version, time of year, survey length, type of questions, and so on. In fact, a key correlation in this year's Survey results clearly indicates that employees need to be actively involved in post-Survey action planning to improve employee engagement. Employees' opinions do count, and the Survey data further proves it. The Employee Survey is one way employees can provide feedback, but there are many ways employees' voices are heard (as shown by your letter to Boeing Frontiers). Other feedback mechanisms include feedback links on internal Web sites, other internal surveys, focus groups, the Ethics Hotline, local leaders' Web sites and employee meetings. Ultimately, the best way we can all make Boeing better for everyone is through two-way conversations between managers and team members on an ongoing basis. Employees who have comments or questions about the Survey can e-mail them to the GRP Employee Survey mailbox, accessible via Microsoft Outlook. Thanks for the great article on Elrey Jeppesen and his storied black book (August 2005). While I was a young man working for A.M. Johnston at the Boeing Atlantic Test Center, Tex told me about the impact of "Jepp's" seminal contribution to air navigation. 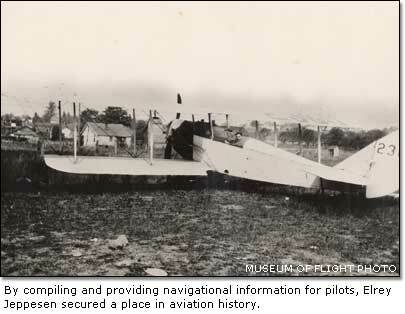 Historical Perspectives like this article, which recognize major developments in aviation history, make Boeing Frontiers all the more interesting. Retirees who receive Boeing Frontiers in the mail may have noticed that there is a reader response card wrapped around the cover of this month's issue. We at Boeing Frontiers are asking retiree subscribers who want to continue receiving the magazine to fill out and return the postage-paid response card by Nov. 1. We are taking this measure to ensure that Boeing Frontiers is being received by retiree subscribers who are interested in the magazine's content—and to eliminate printing and mailing costs for incorrect addresses or unwanted subscriptions. This card will also appear on copies of the October 2005 issue of Boeing Frontiers that are sent to retirees. However, retirees need to fill out only one card, from either the September or October issues, to remain on the Boeing Frontiers mailing list. Retirees who do not return a card by Nov. 1 will no longer continue to receive the magazine after our November 2005 issue. 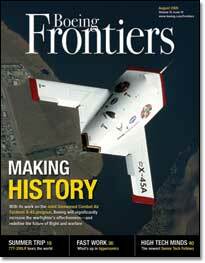 Boeing Frontiers provides its letters page for readers to state their opinions. The page is intended to encourage an exchange of ideas and information that stimulates dialogue on issues or events in the company or the aerospace industry. The opinions may not necessarily reflect those of The Boeing Company. Letters must include name, organization and a telephone number for verification purposes. Letters may be edited for grammar, syntax and size.